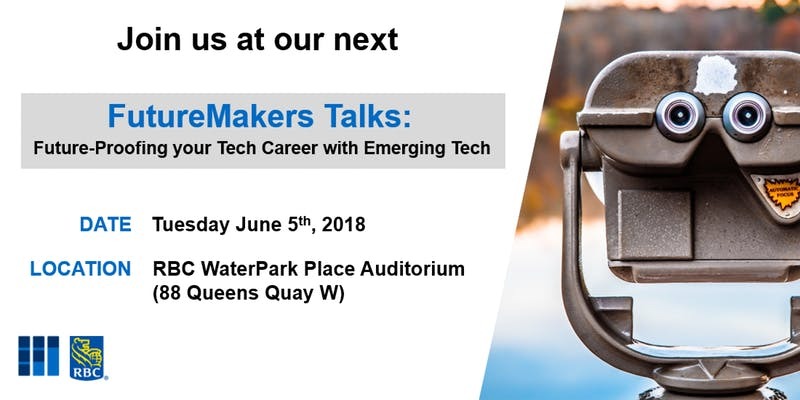 RBC Tech Community Team is proud to present FutureMakers Talks: Future-Proofing Your Tech Career. Please join us for an evening of networking, refreshments, and thought-provoking discussions on emerging technologies and how they will impact your career. This edition of FutureMakers Talks will cover the tools and knowledge to prepare for the future of work in emerging technologies such as machine learning, AI, and cybersecurity. Use the discount code Betakit_2018 to get a free ticket. Will your job exist in the future? How will your skills fit into the landscape of artificial intelligence and quantum computing? This talk will explore the path from today to the singularity and how you can continue to be an active participant in the tech workforce of tomorrow. 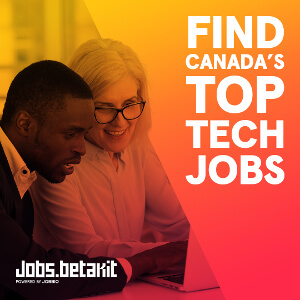 We will look at some of the top emerging careers in technology and the skills that will be demanded in tomorrow’s job market. Learn how blockchain, AI, mixed reality, and quantum computing will transform the tech sector, and how you can prepare to be a part of building this future. Limited Supply: Get an exclusive tour of one of RBC’s Toronto Innovation Labs! Located in the office tower at WaterPark Place, see first-hand RBC’s Innovation Lab and hear about their initiatives. Select the “Ticket + RBC Innovation Tour” ticket to secure your spot.